Someone in charge of explaining the Seattle arena construction timeline to NHL officials recently said in order to make the deadline of an opening by October 2020, all construction, legal and political matters would have to go perfectly. After waiting more than 100 years for another shot at repeating the Seattle Metropolitans’ Stanley Cup victory in 1917, what’s one more year? Because even the NHL owners know, based on the experience of their NBA brethren, when it comes to pro sports and Seattle public works, expecting perfection is an impossibility. Best to plan for mayhem, then dig out. The calendar was bumped to October 2021. Team owners, meeting at a resort in Sea Island, Ga., voted 31-0 Tuesday to make Seattle their 32nd franchise, a milestone event in a sordid civic saga. The marketplace was the largest in North America without either the NHL or NBA. All it took to solve for that was $1.45 billion — the arena cost, plus the expansion franchise fee of $650 million, $100 million of which was paid Tuesday — and a city government willing to say yes to free private money to fix a public building in a public park. In a word, it is astonishing. The official grant of the franchise Tuesday puts largely to rest about a century of caterwauling, finagling, duplicitousness, mendacity, grandstanding, errors of fact and fiction, temporary successes and abject failures regarding major league hockey — and major league basketball — and Seattle. A building plan, a league, a team and ownership is all set to light the hockey lamps. 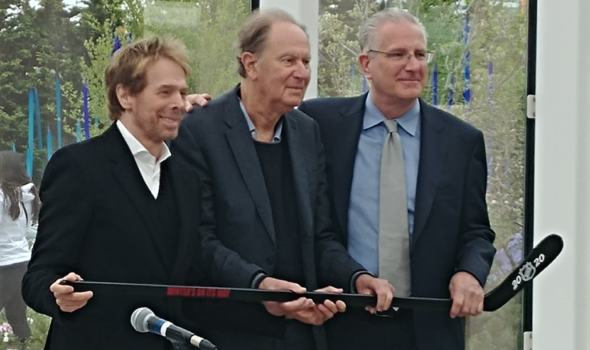 NHL Hockey Partners CEO Tod Leiweke, the former Seahawks boss (2002-10), came back to town exactly for this moment. More than 10,000 online deposits rolled in during the first 12 minutes, 32,000 in 12 hours. They didn’t know anything, but apparently were eager to learn. Also on a learning curve was Oak View Group’s CEO, Tim Leiweke, Tod’s brother. He learned that appeasing all the stakeholders at Seattle Center and the surrounding urban village, already inundated by newcomers and construction from Seattle’s sky-rocketing economy, was going to be difficult and expensive. Long experienced in pro sports and arena building, Leiweke had never been through The Seattle Process. “The most complicated project I’ve been involved with,” he said recently. As a result, it is already over budget and no longer on time, and demolition hasn’t even started. The landmark arena roof must be kept in place, the arena floor must be 15 feet lower to accommodate an expanded footprint, the city’s labor contracts must be honored, and the price of steel soared because of tariffs. On its own, OVG added a $70 million training facility on the grounds of Northgate Mall, which needs to be ready in the summer ahead of when the team begins to train. OVG planners began talking about needing more time, suggesting perhaps having the team play its first month entirely on the road. That’s when the NHL intervened. According to one hockey source, the date of the opener was less important than affirming the 32nd team’s eventual existence. Player contracts need to be done with an expansion draft in mind, so the iffiness around the Seattle’s building readiness in 2020 — including the potential for myriad problems at a site the builder does not own — prompted a pumping of the brakes. One potential benefit of delay is avoidance of a potential labor standoff with the players union that could cast a pall over a start in 2020. The current collective bargaining agreement expires after the 2021-22 season, but the NHL can opt out next Sept. 1. The union can so 18 days later. Music fans did not seem to be around Tuesday to cheer the giving of the word. Almost 200 people, many in hockey regalia, jammed into Henry’s Tavern in South Lake Union to watch live the NHL press conference that confirmed what had been a given known since the surprising ticket-deposit largesse in March. One of the most exuberant fans there was Seattle Mayor Jenny Durkan, a big sports fan. “No city has ever gotten a deal like this,” she said. 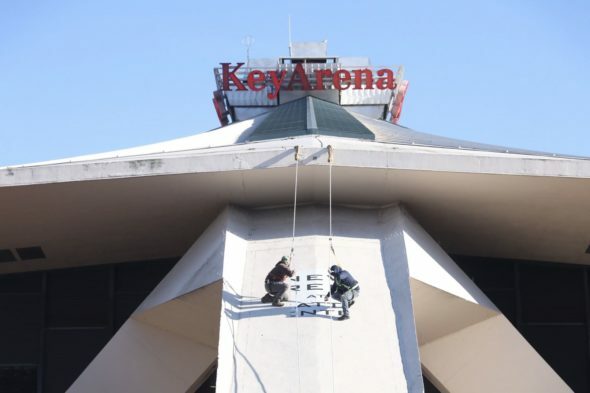 “The amount (OVG) is paying for the arena, and the expansion fee — they’re invested in Seattle. The tradition of of municipal extortion by pro sports teams is long, aggravating and persistent. But with 1.45 billion in bucks from the privates, perhaps the buck stops here. I prefer Glacier Clams. Two indigenous items that move very slowly, like getting hockey back here. Glacier Clams would be great, but I vote for the Seattle Sasquatch. The jersey could have broad horizontal stripes with the silhouette of a big hairy head in the middle and the word SQUATCH across the top. If the Habs can adopt Youppi, why can’t the new Seattle franchise adopt Squatch? Glad we’re onto the big issues. Seattle Sasquatch can be the new XFL team. I think it’s half full too. Am I wrong? Can’t wait to see ’em put the biscuit in the basket, eh? You speak Kokanee? Tim Horton’s? One more year for a Division 1 basketball team (Seattle U) to play in a 999 seat gymnasium. Try selling that to recruits. Well, there’s a thought well down the list. An that, my friend, is precisely Seattle U’s problem. They need to build a 4,000 seat on campus facility. On Opening Night someone needs to put up a banner that says “NBA? So What?! ?” You know the NBA will use the NHL as an excuse not to come to Seattle, saying they need to be primary tenant in a basketball only facility. I hear there’s a guy with a bunch of money and land who would build one. maybe, if he builds it in Bellevue. The city isn’t going to let someone else build a venue to compete with the shiny new one at Seattle Center. Bellevue seems kind of weirdly perfect for the NBA but the traffic would be a nightmare on the scale of Mercer. Or out by Microsoft in Redmond. The sprawl keeps getting pushed out, pretty soon that will be the middle of the Eastside. Several iterations of a Bellevue plan have gone nowhere, which doesn’t mean it can’t work. In five years, virtual reality headsets will make attendance nearly obsolete, so the games could be played at the Pro Club. So where is it then? Hockey is moving much faster than that sorry project. He’s playing a looooong game. I couldn’t miss the NBA any less. Got to an SPU home game for under $10, and enjoy the experience so much more than paying $120 to watch $100 million players sleep walk and trash talk through 48 minutes. And here you are, talking trash . . .
Ah, but what if they’re named the Geoducks? Would you not want to partake in the soon to be annual tradition of throwing a geoduck onto the ice to announce the beginning of the playoffs?? The Geoducks are at Evergreen State. Shocked that you would impugn the NBA’s passion for Seattle. I know…I should be sent home to think about it! Jerry Bruckheimer looks like a 60 year old Seth Green if he made a bunch of bad decisions. Can they retire Payton and Kemp’s numbers? Instead of raising a 12 flag like the Seahawks, can they burn an effigy of David Stern before every game to fire up the crowd? At first intermission, kids could fire pucks at life-size of Howard Shultz and second they could fire at Clay Bennett. Just spitballing here. Um . . . Are we ready to talk hockey yet?